Top: An RFID tag fits a bumblebee like a backpack, allowing researchers to track its movements. Above left: UW graduate student Jeremy Hemberger (left) and entomology professor Claudio Gratton (right) attach a tag to a bumblebee, a process that requires delicate tools (above right). Photos: Bryce Richter. Who knew? Tagging bumblebees can help farmers with their crops. 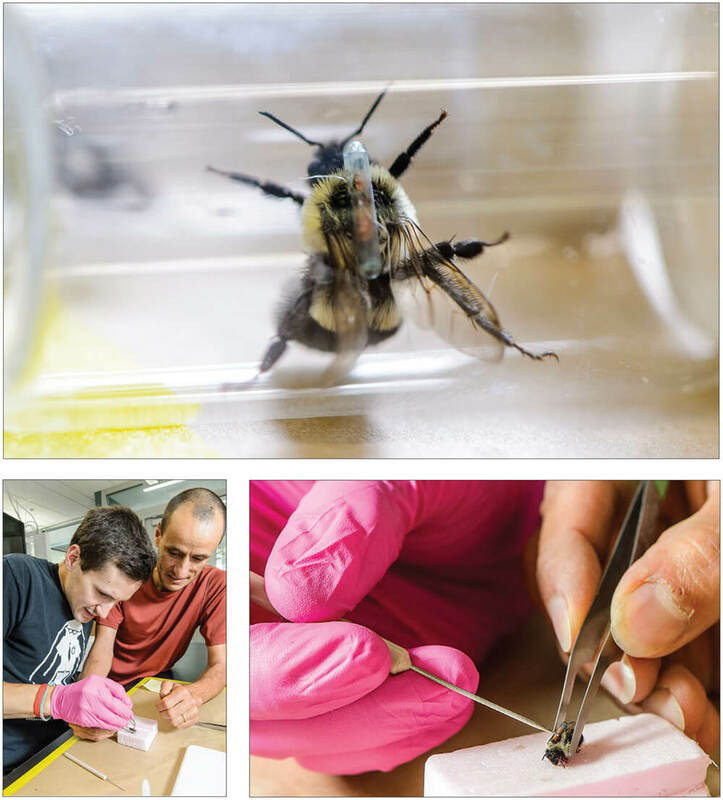 With the precision of a surgeon, Jeremy Hemberger ’12 swiftly, but gently, situated the tiny radio frequency identification (RFID) tag on the fuzzy yellow collar — the pronotum — of the bumblebee. The UW graduate student’s adviser, entomology professor Claudio Gratton, then held the sedated bee steady until the glue securing the RFID tag dried. Then, the bumblebee returned to the colony, wearing her tag like a brand-new backpack. The tags will help Hemberger learn what kind of landscape is best for bees. If they live in a prairie, do they spend less time searching for food than their counterparts in a cornfield? Do bees on woodlots have it better than those in grasslands? By using the tags to track their comings and goings from special colonies set up around the Madison area — from Arlington to Cross Plains to the roof of Russell Labs — Hemberger wants to measure how much time bumblebees spend foraging and resting, based on the resources in their environment. How well do they thrive? Ultimately, he hopes to create a better world for bumblebees and farmers alike by developing models and tools to help farmers optimize both the habitat they provide for bees and the pollination potential of their crops. Unlike honeybees, which are not native to North America and are expensive for farmers to rent for pollination each year, bumblebees can be found across the U.S. and they don’t cost farmers a thing. 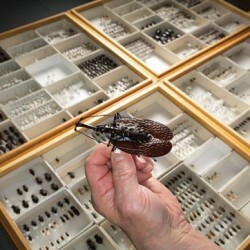 This was a pilot year for the young scientist, who is interested in the intersection of ecology, conservation, and insects. His tagged bees logged four thousand trips from their nests this year, and he’s optimistic, given the lessons he’s learned, that he and his bees will do even better next year.